We celebrate with music and dancing in the street from MIDDAY. May Morning is celebrated on MAY 1st every year. (NOT May Day Bank Holiday Monday). May Morning in Oxford is a traditional celebration of the coming of Spring and brings together Oxford’s communities to enjoy dancing, singing and revelry from around the city. The celebrations start at 6am with the choristers of Magdalen College choir singing Hymnus Eucharisticus from the Great Tower. Hymnus Eucharisticus was composed in the 17th century by a Fellow of Magdalen and has been sung every year from the Great Tower on May Morning. This will be followed by the bells ringing out over the city for approximately 20 minutes. Many bars and restaurants across the city will be open for breakfasts including eateries in the city centre and East Oxford. 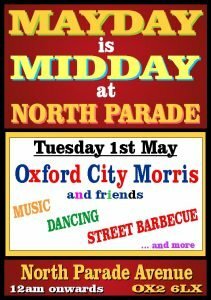 For more information about events taking place across Oxford on May Morning, please visit the Daily Info website. How many different styles of Morris Traditional Dancing are there? Our local tradition is Cotswold Morris; many of the villages in the Cotswolds have their own style of dance. You’ll see dancers waving hankies, and wearing baldricks, waistcoat or rosettes over a shirt, and bells around their knees.North West Morris is from the villages and towns of Lancashire and Cheshire; the mill workers would come out in their clogs and dance in the streets. The dance style was commonly used in processions, many of the dances have been adapted for to be stationary as well as new ones written. Welsh Border Morris is from the counties of Herefordshire, Worcestershire and Shropshire. Face paint or masks are often used as a disguise, and the kit usually consists of tatters dangling from a jacket, and a lavishly decorated hat!Rapper Sword Dancing originates from the mining villages of Northumberland and County Durham; 5 people dance linked using double handed flexible swords, weaving different figures for display.Clog Step dancing grew out of the industrial areas of Great Britain, with the miners and other labours dancing solo in clogs on the spot, often having competitions as well as performing for pleasure. JAZZ inn the COURTYARD – it’s rhythm driven!